Launched in 2011, Jacqueline Shaw, Founder and Director of Africa Fashion Guide has released her book on African fashion entitled ‘Fashion Africa – a Visual Overview of Contemporary African Fashion’ with an aim to celebrate the fashion scene in Africa and the Diaspora through images, interviews, beautiful modern illustrations and critical analysis on sourcing, production as well as an ethical perspective. 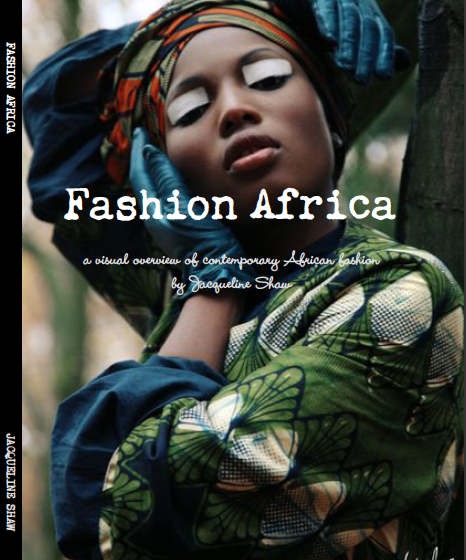 Fashion Africa is an original book available to purchase – click here to buy now! Jacqueline self published this book to showcase over 45 of Africas well known fashion designers and companies such as Jewel by Lisa, Chichia London, Tiffany Amber to name a few through to workshops such as Kenyas SOKO who produce the ASOS Africa range and MantisWorld. With a sub focus on ethical and environmentally friendly fashion design and manufacture this book takes a contemporary look at this growing market and highlights the importance fashion in Africa to the global textile industry. This book is available in hardback as well as paperback covers, and a downloadable PDF and can be purchased here. Get your orders in now and be one of the first to purchase a copy! Check out the link http://www.lulu.com/spotlight/Jacquita to grab a preview before you buy! !